Thanksgiving is a gathering holiday that brings family members together to take dinner and have fun. Many families might record family gethering video clips on Thanksgiving dinner or gathering, especially those who have kids. These Thanksgiving family gethering video clips could be stored on computer hard drive for future review, or burned onto blank DVD disc for safekeeping and sharing with friends. This tutorial offers detailed steps on how to convert and burn Thanksgiving video to DVD discs with professional video to DVD burner software. Leawo Video to DVD Converter, officially called Leawo Blu-ray Creator, could convert and burn Thanksgiving video to DVD-9/DVD-5 disc in a few simple clicks, allowing you to add different elements like menu and watermark. It could minimize the space occupation for Thanksgiving video to DVD burning with no quality loss. Get your Thanksgiving video clips onto your PC and then follow the below steps to burn Thanksgiving videos to DVD disc. 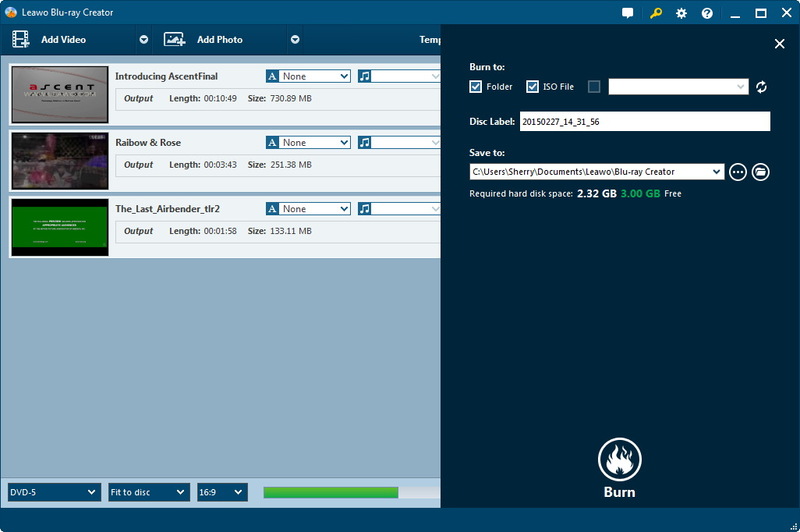 - Burn videos to Blu-ray/DVD disc, folder and/ or ISO image file simultaneously. 1. Drag Thanksgiving videos into this DVD creator. Insert a blank writable DVD disc into DVD recorder drive. Set disc type (according to the disc inserted to the drive), quality and aspect ratio at the bottom. 2. Click the wheel icon on the top right corner and then navigate to the "Burn" option. Select DVD mode from PAL and NTSC under the "Default Video Mode" option according to where you’re. 3. Go back to the main interface, select a disc menu on the right sidebar and then click the middle to preview and edit selected disc menu. You could get more disc menu templates via downloading. 4. Click the big green "Burn" button to set "Burn to", "Disc Label" and "Save to" options. After these, click the bottom "Burn" button to burn Thanksgiving video to DVD. To burn Thanksgiving video to DVD disc, insert a blank writable DVD disc into the recorder drive first. Then, according to the type of DVD disc you’ve inserted, set output disc type at the bottom left corner (as mentioned in Step 1), set the inserted disc as target under "Burn to" option in Step 4. After setting disc menu, you could edit disc menu, including: rename titles, adjust the title position and content, text font, size and color, load background image/video/audio, edit the content on chapter list pages, etc. You could also choose to add no menu by clicking the "No Menu" option on the right sidebar of the main interface. Besides the abovementioned Thanksgiving video to DVD converter to convert Thanksgiving video to DVD disc, you still get another option. 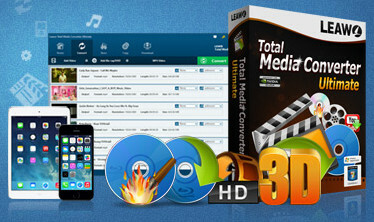 That’s Leawo Total Media Converter Ultimate, the ultimate solution for all media files, including Blu-ray, DVD, video, audio, and photos. - Burn videos to Blu-ray/DVD disc, folder and/ or ISO image file simultaneously, copy ISO file to disc in one click. – Convert video and audio files between 180+ formats. – Decrypt, rip, convert and copy Blu-ray/DVD content with high quality. – Download videos from YouTube, Veoh, VEVO, etc. – Multiple bonus features like video editor, 2D to 3D converter, menu designer, etc. Burn video to DVD/Blu-ray files, with a wide selection of disc menu and template models preset. DIY disc menu and template is allowed. Direct ISO to disc burning is supported as well. As a total media converter, this total media file converter could convert Blu-ray/DVD/video to video in HD/standard video file formats for playback on different devices. Meet popular 3D movie needs with various 3D effects for 2D to 3D conversion, including: Red/Cyan, Red/Green, Red/Blue, Blue/Yellow, Interleaved, Side by Side. 3D Depth is adjustable. 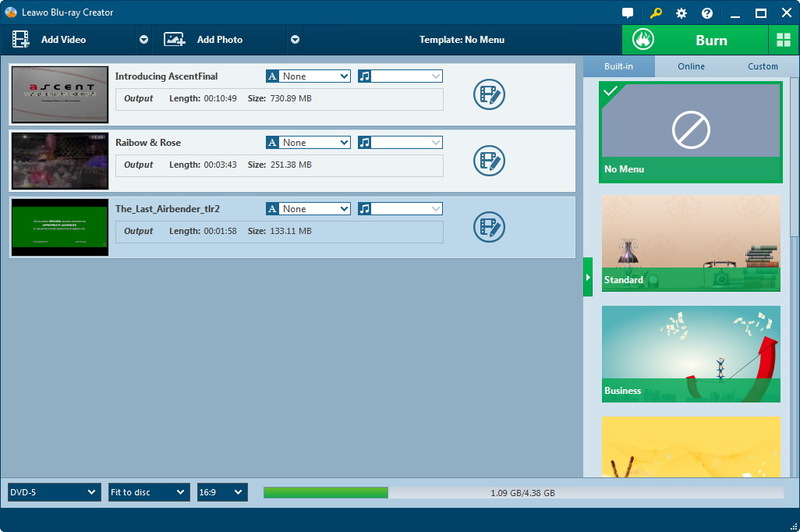 Customize output files with provided practical video editing features, including: trim video length, crop video size, adjust video effect, add image or text wartermark.